Gertrude Käsebier's Mother and Child is among thirty-five stellar works by photographers associated with Alfred Stieglitz's famed Photo-Secession recently acquired by the National Gallery of Art. In the early 1900s Stieglitz formed a group he called the Photo-Secession that brought together several photographers whose work he believed represented the finest examples of the art of photography. Members included Käsebier as well as such now-celebrated photographers as Alvin Langdon Coburn, Edward Steichen, Karl Struss, and Clarence H. White. A fierce promoter of photography's artistic merit, Stieglitz founded a Photo-Secession gallery in New York and reproduced the group’s photographs in his lavish journal Camera Work. The Photo-Secession rebelled against the clear-eyed, often more pragmatic or topographic approach of many 19th-century photographers. Eager to prove that photography was capable of artistic expression, the Photo-Secessionists instead produced images that were more suggestive than explicit, more evocative of moods or feelings than bald descriptions of fact. Käsebier, the most successful American portrait photographer in the first decade of the 20th century, was a founding member of the Photo-Secession. In addition to her innovative portraiture, such as the Gallery's 1902 photograph of Alfred Stieglitz, she often used photography to convey her feelings about childhood and what she called "the tremendous import of motherhood." 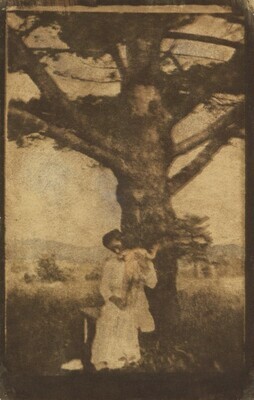 A staunch believer in recent educational theories that urged adults to foster children's intellectual growth and independence starting at infancy, Käsebier frequently depicted—as she does here—a mother in the delicate position of simultaneously protecting a child and encouraging his or her exploration of the world. Mother and Child also highlights Käsebier's extraordinary printing skills. The lush, soft-focus image has a painterly quality—at once velvety and ethereal—that derives from Käsebier's facility with manipulating the surface of her gum dichromate prints. By printing the negative successively on the same sheet, and varying the pigmented emulsions, she was able to produce an expressive, subtly colored image that seems to hover between painting and photography. The newly acquired works by Käsebier, Coburn, Steichen, Struss, and White complement the Gallery’s unparalleled collection of Stieglitz photographs. Together these images showcase the birth of the movement dedicated to advancing photography as a fine art. Private collection; NGA purchase (through Charles Isaacs Photographs Inc., New York), 2008. In the Darkroom: Photographic Processes Before the Digital Age, National Gallery of Art, Washington, 2009 - 2010, unnumbered catalogue.